Cambodian seafood noodle soup at VH Noodle House. I don’t know what it is about Asian restaurants in strip malls. I can’t resist their pull, especially when the cuisine is one less commonly found. Such is the case with VH Noodle House, which I tried out a few months ago at the Pacific East Mall in Richmond. The restaurant’s tiny and florescently-lit space was packed, and I thought that would be a sure sign that their noodle soups are worth the wait. What are Cambodian noodles, you ask? I was wondering the same thing when I ordered with Cambodian seafood noodle soup. It turns out that Cambodian noodles are simply your standard thin egg noodles of the Southeast Asian variety. (At least that’s what they are at VH Noodle House.) Which was fine with me, because I love egg noodles. 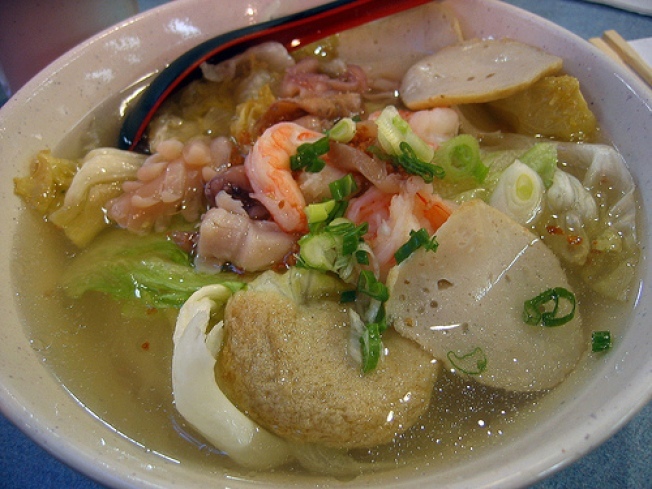 The soup was filled with these noodles, lettuce, green onions, shrimp, squid and my favorite, slices of sodium-laden fish cake. I would have preferred a more flavorful broth, though flecks of fried garlic and my liberal garnishing of chili sauce helped round things out. The broth was also greasier than I’m used to, though perhaps this depends on the type of soup you order. VH Noodle House is the type of place I might find myself at on a cold, rainy day for a quick lunch while out running errands. And now that fall is right around the corner, it’s about to be noodle soup season again.